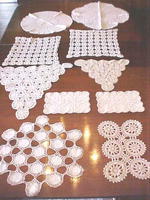 Offering these ten vintage crochet doily/scarves including: one 16 x 14 line circle scarf - each circle is joined together with pretty crochet in pale taupe; one 12 x 8 taupe crochet scarf made of medallions; two 9 x 6 soft linen scarves with floral embroidery in taupe, open french stitching and taupe crochet trim; one 19 x 17 v shaped scarf made of light taupe crochet medallions; one 13 x 12 v shaped scarf made of taupe crochet medallions; two 14 inch square pale ivory scarves made of open stitch work crochet circles; one 16 inch diameter crochet scarf in light ivory, and one 21 x 19 scarf - unusual shape, ivory crochet. All are in good++ condition no holes or stains unless noted individually above. Freshly cleaned and ready to use. A lovely group of needlework for your spring and summer decorating!